GUE has teamed up with Halcyon Manufacturing for a 2013 Project Baseline Fundraiser! We are pleased to offer a limited-edition BC package that includes your choice of black and grey Evolve or Eclipse wing with a specially designed logo, a matching gear bag, black and gray webbing, and matching t-shirt and sticker. Additional webbing and limited edition storage packs are available as part of the package purchase; additional shirts and stickers available separately. Proceeds from the sale of these items will go towards funding Project Baseline. For more information about Project Baseline, or to learn about the work being done worldwide, please visit www.ProjectBaseline.org. 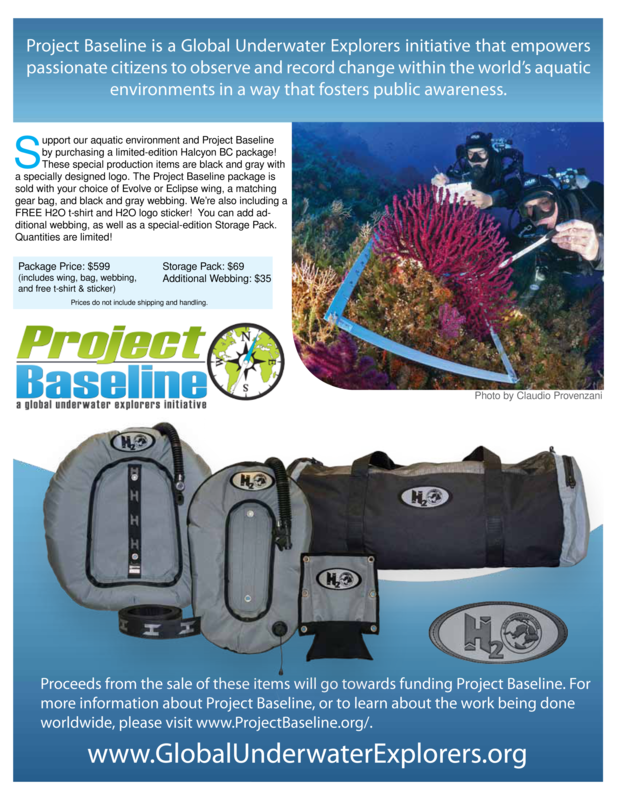 To order your package, visit www.GlobalUnderwaterExplorers.org/pbfundraiser.